Data Copy 7.5 Free Download - Find, Copy, Print, Create, Query, Edit DataSnap, DBExpress, Access, Excel Files. Find, Copy, Print, Create, Query, Edit DataSnap, DBExpress, Access, Excel Files. 1. Copy Data between DataSnap, DBExpress, Access, and Excel Files. 2. Select File and Fields to copy from and File and Fields to copy to. 3. Copied data is always appended for safety. 4. Excellent Database File browsing available to quickly view Tables. 5. 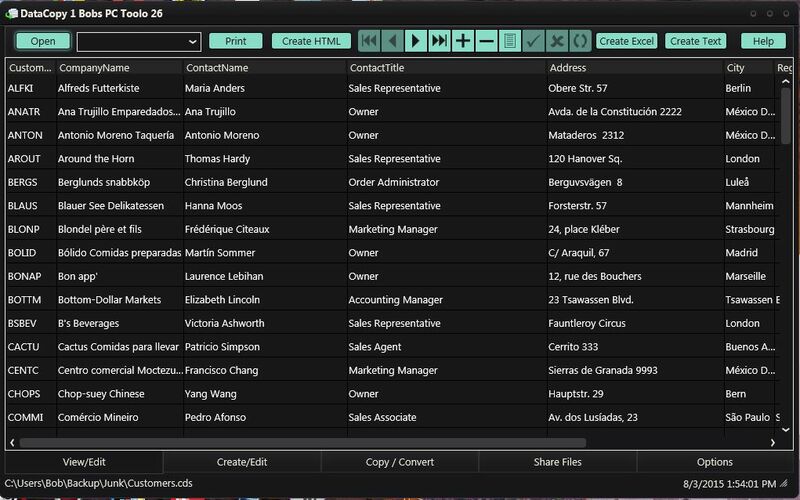 Design and Create DataSnap, DBExpress, and Excel Files using Data Copy. 6. Edit and Add Data Records for supported Database Tables. 7. Create HTML Pages of Table Data for selected Fields and Records. 8. Run a query on the file to be copied to select specific records to copy, print, or create HTML Pages. 9. Save Database files with a new name and disk location. 10. Send and Receive Database Files over the Internet E-Mail. 11. Copy CDS, SDB, MDB, and XLS Files to Text File, and Text to CDS,SDB,MDB, or XLS. 12. Copy file format without transfering data between DataSnap, DBExpress, Access Files, and Excel Files. 13. File Supported : CDS, SDB, MDB, XLS, TXT, LST, WRI, DOC, HTM, HTML. 19. The Database File Copier Program was fully tested for use under Windows 7, and Windows 10 with Pentium Class microprocessors. 20. Share Files on the Local Area Network with other computers running DataCopy. 21. Load Files up to GSheets if signed up for GDrive. Download Sheets and save as DataSnap Database File. Statement: First, please download the orginal installation package by clicking the download link. Of course you may also download it from the publisher's website. Using Data Copy crack, key, patch, serial number, registration code, keygen is illegal. The download file hosted at publisher website. We do not provide any download link points to Rapidshare, Hotfile, Depositfiles, Mediafire, Filefactory, etc. or obtained from file sharing programs such as Limewire, Kazaa, Imesh, Ares, BearShare, BitTorrent, WinMX etc. Software piracy is theft. If you like Data Copy please buy it.